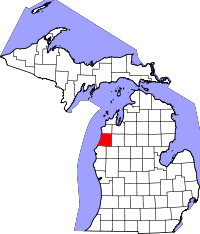 Manistee County, partial home to the Manistee National Forests, a nearly-one million acre protected forest, allows vital records researchers to peruse county records, however actual searching is performed by the County Clerk staff. Their website provides request forms and applicable fees to apply for birth, death, and marriage records, all of which are available from 1867 to the present, by mail. Birth records dated after approximately 1900 are not open to the public record yet, though records dated prior 1900 are. Circuit Court criminal records are also available from 1867, and divorce records from 1950. Space is limited at the County Clerk genealogy research area, which is located in the Government Center of Manistee, MI., on 415 Third Street, and four people are allowed access at once. Individuals are suggested to contact the office prior to arriving to confirm availability. Regular hours are 10:00AM to 11:30AM, and 1:30PM to 4:00PM, Monday through Friday.